The new Emmanuel House headquarters. ♦ Watch a video of the grand opening. This past Easter Sunday evening, Emmanuel House co-founder and board chair, Rick Guzman, and me, and my wife Linda were there from 6 p.m. to midnight painting offices that Emmanuel House’s executive director, Hayley Meksi, and her husband Lorent had spent hours priming earlier in the day. 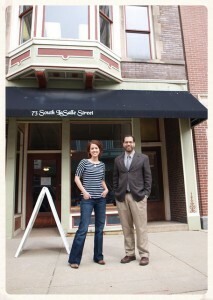 Would our rehabbing of 73 S. LaSalle St. in downtown Aurora be done in time for the May 2nd move-in date of World Relief, who were set to share our first headquarters with us? It didn’t seem so. Unpainted walls, still unconnected electricals, construction debris and equipment, dust and trash everywhere. It didn’t seem so when I returned for more work a few days later, and a few days after that it still didn’t seem so. But it did get done. And on May 22nd World Relief hosted a Grand Opening with ribbon cutting at 4:30 p.m.
It’s a milestone step for both organizations—and Aurora’s downtown. It’s another step in our family’s honoring of Bryan Emmanuel Guzman. World Relief helps settle refugees in the United States, and Emmanuel House helps break the cycle of working class poverty through home ownership and education. Think of Emmanuel House as an expert snowball maker. Not only are they the neighborhood friend that you want to know on a cold day, but they have been working for over six years to collect individual snowflakes, or community partners, to create a non-stoppable force in Aurora. Rick Guzman, who founded the Aurora organization with his wife, Desiree, says what Emmanuel House really does is partner with a host of other non-profit organizations to accomplish their mission. Guzman said that the non-profit organization takes on more of a mentoring role in providing tools to local families. They help families become homeowners, but they also empower people and create opportunities. Through a tested and proven model of assisting families with saving rent, those families can then purchase their own home and start building equity after as little as 18 to 24 months. Check out the model and see how it works HERE. Emmanuel House, named after Guzman’s deceased brother, leverages community resources and what Guzman calls “latent potential” to help break the cycle of poverty one family at a time. “When someone reaches their full potential, then we all benefit,” said Guzman, who also works for the City of Aurora. Emmanuel House currently operates 17 apartments in Aurora where families reside while they are enrolled in the savings program. “The impact is far reaching,” said Hayley Meksi, director of Emmanuel House. She added that home ownership helps the entire community in many ways. Emmanuel House purchased their building at 73 S. LaSalle St. in 2012. After a major renovation, they are now moved into part of the second story and share offices with World Relief, who occupies the ground floor of the building. World Relief helps to resettle refugees and was formerly located at 14 W. Downer Pl. in downtown Aurora. 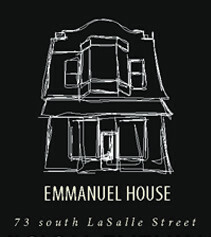 Emmanuel House and World Relief are celebrating with an open house on Thursday, May 22 from 4:30 to 7:30 p.m. This entry was posted in Family, Social Change and tagged Bryan Guzman, Emmanuel House, Hayley Meksi, Rick Guzman. Bookmark the permalink.